The 2017 festival featured numerous apple-themed products and contests for the entire family. Along with fun activities, vendor booths were also open all weekend, featuring crafts, food, and other goods. NEW PARIS —Get ready for apple dumplings and family fun this weekend — it’s time for the New Paris AppleFest. AppleFest is set for this Friday, Saturday, and Sunday, Sept. 21-23, at the old Jefferson School grounds in New Paris. According to organizers, the festival will showcase lots of food vendors with apple-inspired dishes, several arts and craft vendors, a parade and classic car show on Saturday. The car show, sponsored by New Paris Kiwanis, will run from 8 a.m.-3 p.m. on Saturday. The parade will begin at 11 a.m.
DJ Bill Floyd will provide music all weekend. There will be live music and entertainment throughout the weekend. The festival will be open 5-9 p.m. on Friday, 8 a.m.-9 p.m. on Saturday, and 11 a.m.-5 p.m. on Sunday, with a community church service beginning at 10 a.m. on Sunday. Children can enjoy rides and blow-up inflatables and carnival games all three days, as well as presentations by the “Bug Guy.” Valley Exotics will be on hand with a petting zoo, and there will be several apple-related contests for families to enjoy. According to organizers, the full schedule is expected to be posted online by this Thursday, Sept. 20, at www.newparisapplefest.com. A complete schedule was unavailable at press time. AppleFest is sponsored by the New Paris Chamber of Commerce, Convention and Visitors Bureau. For more information,visit the AppleFest page at www.newparisapplefest.com. https://www.registerherald.com/wp-content/uploads/sites/41/2018/09/web1_1Apple9.jpgThe 2017 festival featured numerous apple-themed products and contests for the entire family. 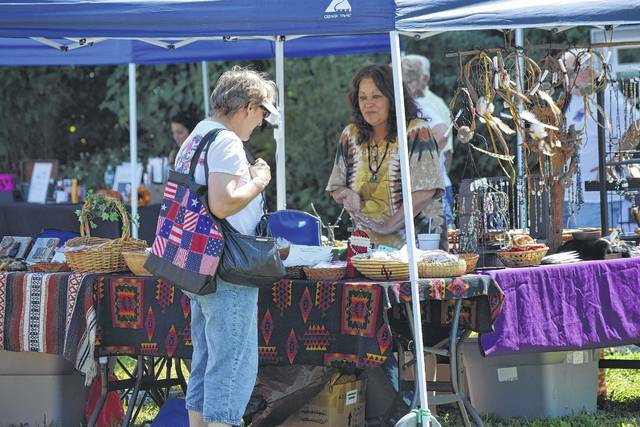 Along with fun activities, vendor booths were also open all weekend, featuring crafts, food, and other goods.